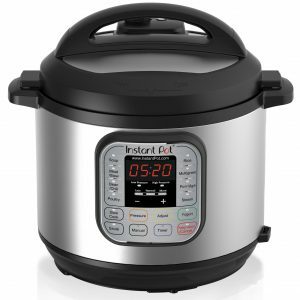 Here are the pressure cookers we recommend by type, if you have any questions be sure to visit the Pressure Cooker Buying Guide and take a peek at our Pressure Cooker Reviews. If you decide to purchase items on this page amazon.com will send a small percentage of the purchase price to support the hip pressure cooking (at no extra charge to you). Thank you for the support! Don’t miss our Top 5 Electric Pressure Cooker Buying Tips + 3 Top Recommendations! A pressure cooker set, where one pressure cooker lid is shared between two bases of different sizes, lets you choose the one most appropriate size to the amount or type of food being cooked. This is our recommended “first” pressure cooker for beginners because the shape allows for both basic advanced pressure cooking techniques – including stacking accessories for steaming foods and constructing a one-pot-meal. This is our recommended cooker for advanced cooks who are trying to move most of their cooking under pressure. The extra-wide base allows for browning meat in one batch and more area for the meat to be in direct contact with the heat. These are recommended for preserving only, no direct cooking should be done in these canner. We’ve only tried the Presto, but the others are highly recommended by those in the know. Buy the highest wattage induction burner you can afford and your kitchen outlets can handle – the low-wattage cheaper induction burners can bring a cup of water to a boil in a couple of minutes, too, but increase that to a 16 cup soup or stock and they begin to struggle and show their “you get what you pay for” cheapness. Measure the inside width and height of your pressure cooker carefully prior to purchasing. Electric Pressure Cookers: purchase silicone steamer basket. Measure the inside width and height of your pressure cooker carefully prior to purchasing (include the height of the trivet or steamer basket that will be used in conjunction with these containers). If the lids have plastic handles, do not use. If the lids lock, do not lock while under pressure (they are not designed to regulate pressure). For electric pressure cookers with a non-stick coating, please use a silicone steamer basket in place of a trivet to ensure the coating is not scratched. Measure the diamater (from the widest point to the widest point at the opening) of your pressure cooker carefully!